I thought I’d create a quick painting to show the difference between Golden’s absorbent ground (left side) and Golden’s light molding paste (right side). The absorbent ground is much thinner and soupier and, therefore, smoother. What I like is that these products not only work with watercolor, they are easy to correct. Watercolor lifts right back to the light molding paste or absorbent ground (in this case, applied to the white canvas panel) very easily. Once the paint has dried, it still lifts easily with a damp paper towel or rag. I hope we are all dancing through this lovely June week! Hoping for more LARGE (well, 8×10″ is still large to me) acrylic paintings soonish! Really enjoying them. And tomorrow will be the June installment of Draw A Bird Day, for anyone interested in participating by posting some bird artwork! *peep peep* Peace. I look forward to seeing your bird posts! Yup, foam from a wave was what I had in mind. Your trip to NC is making me yearn! Yay for birdies on the morrow! Glad you’ll be joining in. I’m looking forward to a day of birds! Ooo, I like this painting, it makes me want to dip my toes in the blue. It reminds me of the Gulf off Venice Island in Florida. You’re welcome, Connie. It makes me wanna run for the beach, too! Beautiful picture – it also made me think of a beach (but in Crete). Please! I can sometimes be transported by staring at a painting. 🙂 Thanks Rebecca. 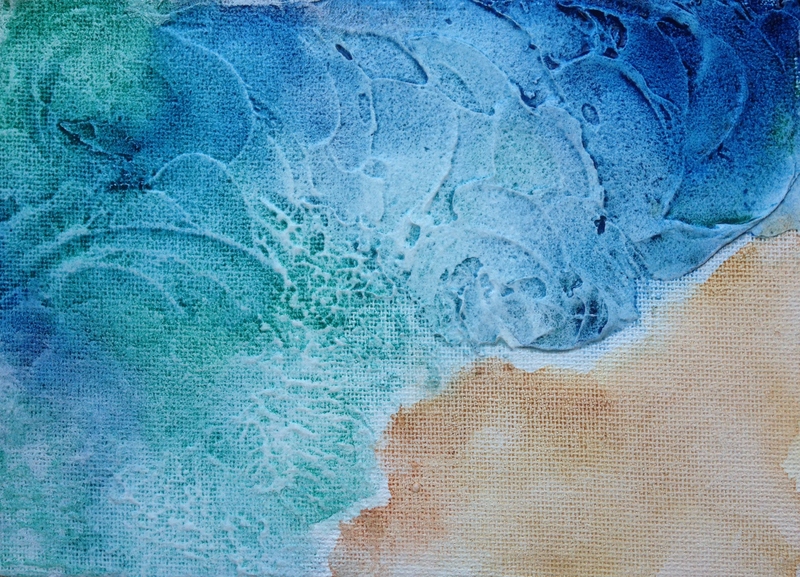 Your experiment looks lovely, just like ocean waves, the colors work so well with the texture and the changes of shading. Did a bit of ‘dabbing’ with the DS Ground, but will have to continue experimenting. Wanted to build small points of texture but not necessarily cover up areas…may have to order the transparent ground and see if that works with my crazy notions better. Oh the joy of playing with paint and other mediums. Thanks, Haunani! Yay, such a joy! Right? It is what I love the most about art. It is like playing in the coolest amusement park ever, that never closes! awwww! Steven, this would make my year. It seriously would. I spent most of my life wanting to be a writer. This comment made my night. Thank you. I’ll give it some thought. One of the main characters in my WIP isn’t fully fleshed out yet. She could very well be someone who dabbles in art. I think it would fit her personality. It might… I’ll definitely let you know. I’ve always been interested in the process and the creative personality of painters, so it might be a good fit for her. Well, it would be very cool, but definitely don’t let my comment influence you. Those people have to breathe. Laura, I think you have found your medium. This is a stunning painting. Debi will be proud of your progress!! I will Susan! Thanks for joining me! Super cool effect and result you’ve created, L!!!! Thanks so much, C! So glad you enjoyed it! I got my “little box” of goodies yesterday, opened it to look, and am overwhelmed…. LOL – Don’t even know where to begin. What was the first thing you did or what would you recommend? You are right – there is so much more to acrylics than I knew…. All these texturing compounds, etc. I still feel like I’m learning watercolor – not sure what I was thinking when I bought – haha! Got caught up in your excitement I think. 🙂 Now you need to tell me what to do with it. Your painting is so beautiful – definitely the ocean and sand. So lovely. How large is it. Will this go in your gallery collection? Have you started selling any yet? Thanks for sharing your experience and learning process of the products! Ok – cutie – I will have to do this 🙂 Thanks for the direction!! Thanks so much, you’re too kind, Jean! 😀 Enjoy your trip! I also thought it looked like a beach. Have you tried yupo before? It’s synthetic paper that’s very smooth and watercolor does strange things on it because it sits on top without soaking in. It’s also extremely easy to lift watercolor from it, but that makes it challenging because it seems like very move results in accidentally lifting paint. I have some and haven’t tried it yet, but really looking forward to it! Have you ever tried yupo with acrylics? I probably have, but I don’t remember. I’d imagine thinning it with much water would cause some adhesion issues. I’d like to know the official answer to that. I think you can use some but not sure of the ration. Even just dampening the surface and adding fluid acrylics would be fun on this, I think. And I’m in for Bird Day! I’m glad about that one too Charlie, lol! Thanks for joining in! So glad you enjoyed it! oops, I should go back and tag this with your tag, argh for trying to blog during work hours lol! Thanks, Myriam, that’s where I was trying to escape in my mind at the time hehe! 😀 I was so pleased with how quick and easy this was to create! Thanks so much, Jill! Me toooo! Yes, let’s! 😀 Thanks, Carrie! Fun! Cool! Playful! I’m such a fan of molding paste for wc, and yours certainly showcases its assets beautifully!! lovely balance – in all areas Laura. its not too busy, just right. I’m so glad lots are reading this post and seeing what molding paste can do with wc! sheer fun. It really is, Debi! Thanks so much! The left side of this painting is Golden absorbent ground, which is much thinner than the LMP. Have you ever used this to correct a wc painting? Chris Cozen says you can. I’ve not tried it. yes, I’ve tried it. and, for me personally…. I don’t find it suits Me. You may love it, and it may be the bee’s knees for you! I just so much more prefer molding paste. or gesso. or…… to work wc on impasto medium!!! Very interesting! I keep reading about molding paste, so I guess I’ll have to put that on my ever-growing “want” list. 🙂 Texture is one thing I’ve always loved in art, so it would be good to learn how to create it! I love those “waves” you’ve painted. It really can be overwhelming! And totally addictive! Yes, there’s just so much…how can anybody keep up with it? I know the answer. We can’t. But we can sure have fun trying! Thanks a lot! The texture products made this one so easy. Thanks very much, I really appreciate that! I was surprised and pleased at how easy this was and how well it turned out. I kind of thought mixing the two texture products on a little 5×7 panel would look choppy but they blended pretty seamlessly! Thanks again! Thanks Ann! This was crazy easy as it turned out. Those products really do the work for you!